We have found, contacted and guided thousands of people, just like you, through the process of recovering what is rightfully theirs. Prior and Associates has worked with thousands of individuals and entities over the last twenty years. Some of our clients send us letters after we have completed an asset recovery for them. 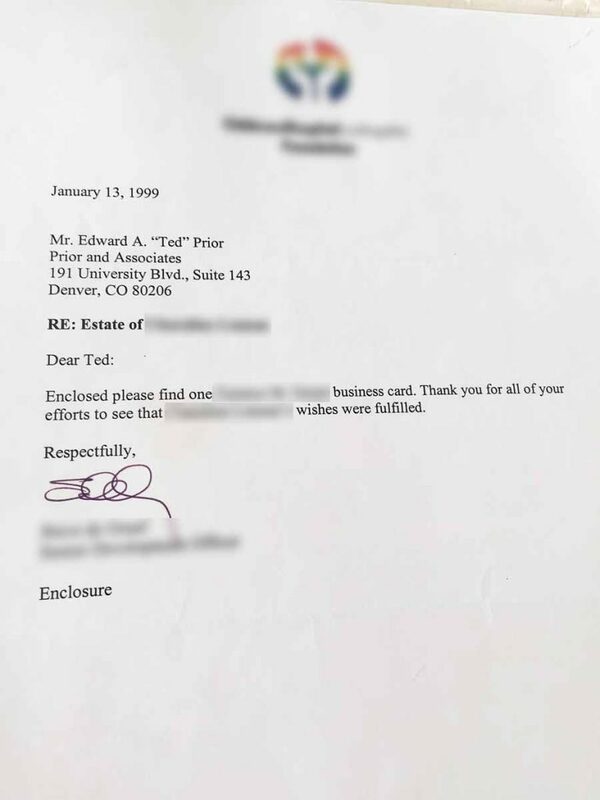 For privacy reasons, name and address information has been removed from original testimonials. Upon request, we will furnish contact information for referrals. Below is the text from some of the letters we received. There are also images of actual letters that you can enlarge and read for yourself. “We hope this letter finds you happy and healthy at the beginning of a new year. It will be a great year for you I hope. 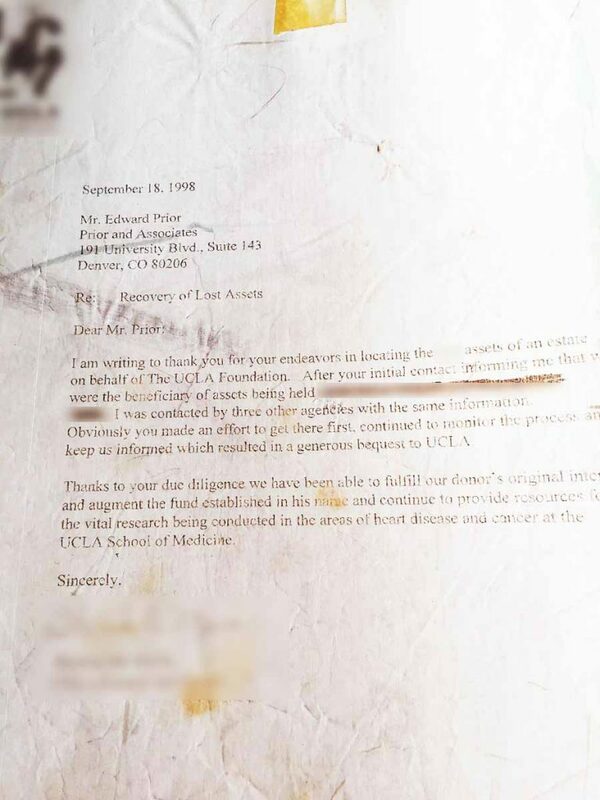 Again, many thanks, you can’t imagine the difference you’ve made in our lives.” ~ Kim W.
“With kind regards for all you did to keep this case moving forward. I am very grateful for the unexpected windfall. Please come to Nantucket if you visit Boston or the Cape. It would be my pleasure to meet.” ~ Lynn D.
“Thank you, thank you, thank you. In my wildest dreams I never thought I could receive a check for $$$ and write this commission check to you. Thanks to you I went from being a zero to a hero. Keep up the good work and continue to make others happy as yours did me. 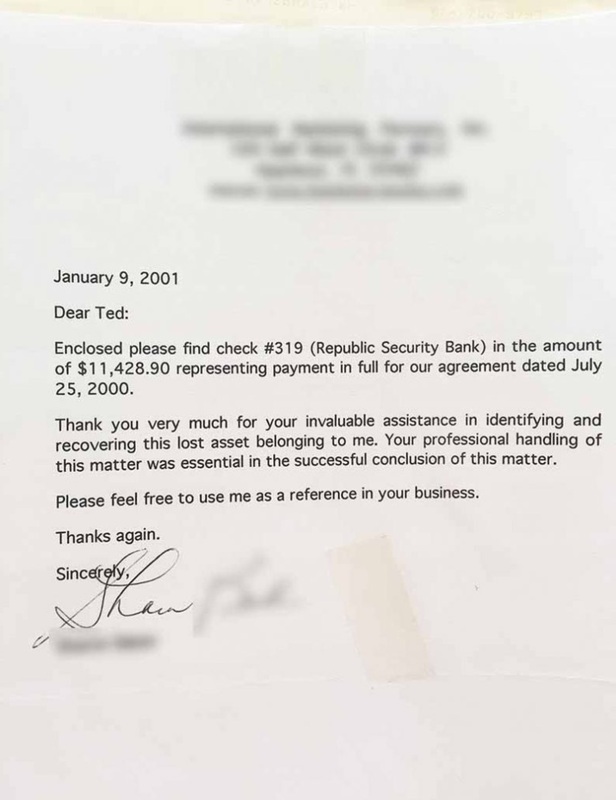 Again, many, many, many thanks.” ~ Ted D.
Thank you for identifying and assisting me in the recovery of my lost assets. My family will be forever grateful to you. 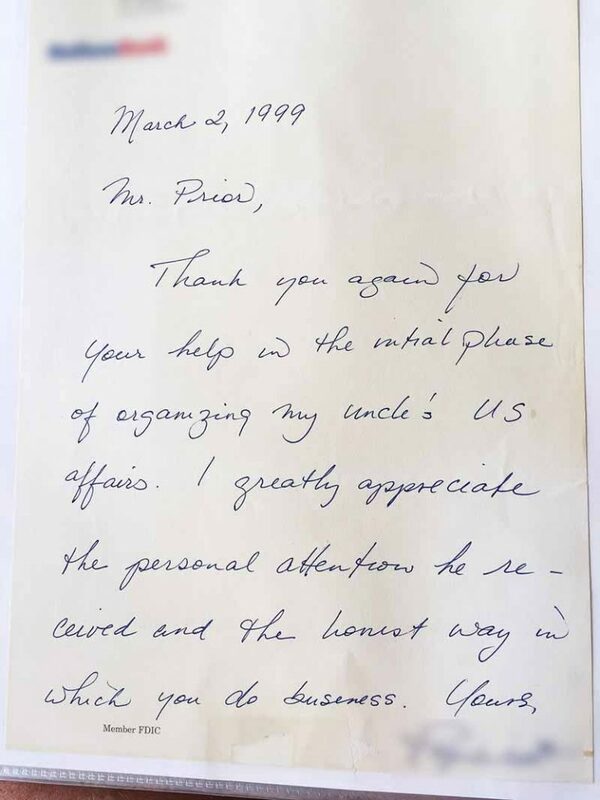 I will gladly act as a reference for you if you want me to do so.” ~ Susan W.
“Thank you for finding our assets and all the work you did in finding me and taking care of all the processing needed so I could receive the benefits, which is very much appreciated.” ~ Grace E.
HERE IS JUST A FEW OF THE MANY LETTERS WE HAVE RECEIVED FROM OUR CLIENTS. CLIENT CONTACT INFORMATION HAS BEEN BLURRED TO PROTECT PRIVACY. PLEASE CONTACT US TO VERIFY THE CLIENT CONTACT INFORMATION FOR ANY OF THESE LETTERS. "You probably don’t remember us, but last year at this time you gave my family the gift of a lifetime. I know that sometimes the money and assets you find for people end up being less important to the recipient than the money you found for us. This note is just to let you know what we’ve done with our windfall, and how much appreciated it has been. We’ve taken care of things that were long overdue. We’ve roofed our house, which was starting to rot. We replaced a window which was in bad shape. We replaced our driveway and the plumbing in our kitchen and bathroom and paid a lot of doctor’s bills. Our children have also gotten some of the things they’ve needed; heating oil, etc. Our son, a father of four, is laid off and we’ve been able to buy him groceries. It sounds pretty mundane doesn’t it? But when you haven’t been able to take care of these things for a long time it feels wonderful! "Thank you, thank you, thank you. In my wildest dreams I never thought I could receive a check for $$$ and write this commission check to you. Thanks to you I went from being a zero to a hero. Keep up the good work and continue to make others happy as your did me. Again, many, many, many thanks." 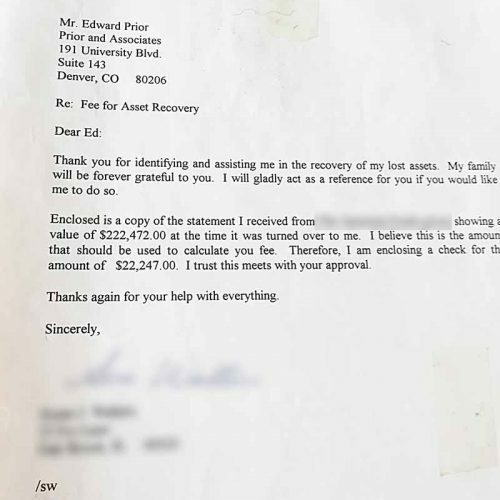 "Thank you for identifying and assisting me in the recovery of my lost assets. My family will be forever grateful to you. I will gladly act as a reference for you if you want me to do so." 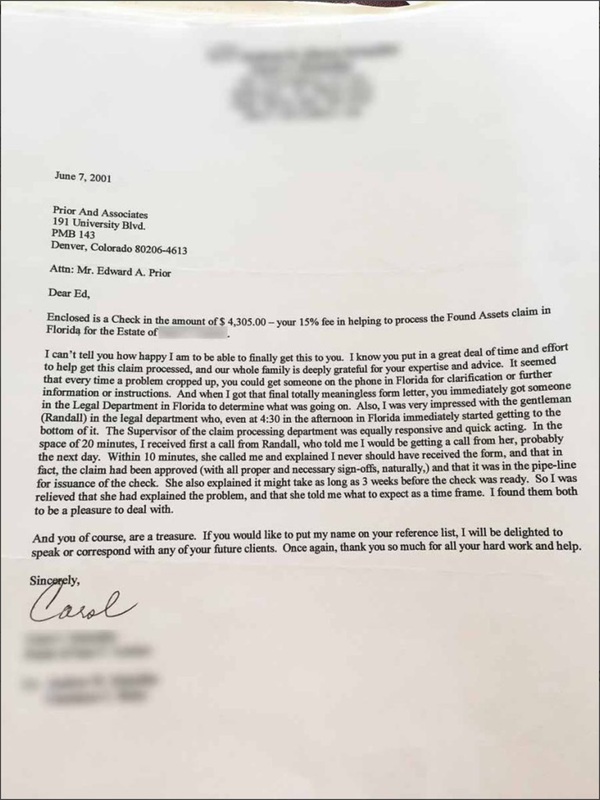 "With kind regards for all you did to keep this case moving forward. I am very grateful for the unexpected windfall. Please come to Nantucket if you visit Boston or the Cape. It would be my pleasure to meet you."